Glock may heat up the already bustling concealed-carry market with a larger G43 with a 10+1 capacity. This is a mockup of what that might look like from the side. Rumor has it that Glock’s big reveal for 2019 is a new pistol for the concealed-carry market. If true, it means that the Glock 43 is getting a bigger sibling, the Glock 43X. Supposedly the major change is to the grip frame. 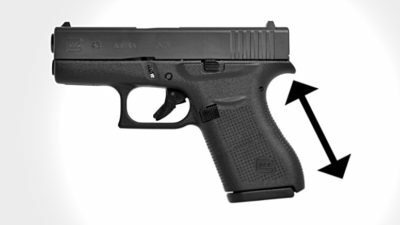 By lengthening it and making it a little wider, Glock can pack a 10-round magazine into a package not that much larger than their first single-stack 9mm model. “Compared to the dimensions of the G43, the G43X grip is ‘4mm wider and 15mm longer than a G43’ to accommodate its new 10-round magazine,” said Rob Curtis. By using a tapered, semi-staggered-stack magazine, this seems more than reasonable. It may even be possible for the new frame to fit in existing holsters, but that could be wishful thinking, too. Right now this is all speculation, but there’s a growing trend for higher-capacity handguns designed for concealed-carry. This is true for both commercial and police markets. SIG Sauer effectively created a new category of carry pistol a year ago when they announced the P365. Partly single-stack and partly sub-compact, they invented the “micro-compact” with a stepped magazine. Magazines like these are long enough to provide a full-handed grip but thin enough to conceal easily, and they offer a round count advantage over single-stack mags. This also lets manufacturers go with slimmer slide assemblies and thin or flush controls. Such a gun would be a little heavier than a Glock 43, at 16 ounces unloaded, but likely lighter than a Glock 26 which weighs 3 ounces more. Add ammo and a magazine and that makes even more of a difference. But the real advantage is ergonomics. Adding a longer grip is better when shooting, especially with minimal bulk and with less bulge. Short double-stack grips may have the same or slightly higher capacity, but they can be hard to shoot since they’re simply cut-down versions of full-size guns. It’s hard to deny that guns purposefully designed for concealed-carry have advantages over guns designed for duty and home defense when it comes to every day discreet carry. If this rumor pans out, Glock is likely to sell a lot of these, and not just to Glock fans. One of the things that Glock could do, but most likely never will, to increase capacity while maintaining size is to go to a metal mag such that the internal volume would be increased while maintaining the exterior volume. Glock seems to be confused by the CC market. I don’t have a problem with the barrel printing. I didn’t want a g19 with a bigger grip, I want a g19 with a longer slide. That’s the mod people actually do. And I know this isn’t just a glock thing. I’ve seen people mod TCPs with long magazines and grip wraps. It just makes no sense. The first “micro-compact” 10+1 cc pistol was the Kel-Tec P-11. It’s had a 10+1 double stacked magazine for decades now. It may not be “cool enough” by some elites but it was first. It’s not a “pretty” range gun but it goes bang every time you pull the trigger “11” times. Give credit where credit is due. I was going to say the same thing about the Grendel P-10. I have owned both, but sold the Grendel years ago. I only have a pair of P11’s left. I thought the first one was going to wear out… but after 20 years, the second one is still a safe queen. Fantastic design. So much so that S&W, Ruger, Taurus, and a few others have nearly direct copies on the market. Imitation is a sincere form of flattery. You knew it wasn’t going to be long before the P-365 stirred up the CC nest. That’s good for all of us gun guys. can I say “Guy” and not offend ? Another Glock to solve the wrong problem. All that’s really needed is Glock 42 and 43 with an 8 round magazine capacity. That would give a full hand on the grip. I’ve had a Glock 26 and the problem was solved on it with a Glock 19 magazine and magazine adaptor. We don’t need another Glock 9mm. Just give us an 8 round magazine for our models 42 and 43! Longer grip length is harder to conceal. I’d rather see them offer the 22, 23, and 45 with a MOS version. Too much attention has been given to the 9mm as of late. Excellent pount… I was almost tempted by this article to rush out and buy one as soon as it became available… But then, I remembered I carry my g34 owb concealed under a jacket with tti 21 round mags, along with my g26 iwb… why bother with a ten round concealable glock that carries 10 rounds concealed if I can’t stick that big 21 round magazine in it? Maybe in Dr Who’s world, but how would adding a mag with the same number of rounds as a G26 make the 3 of different even greater? Am I the only one noticing the 43X should take 26 magazines?? Ummm yeah!! It’s still a Glock, they know they are losing out to Sigs and Shields. Why buy another block of junk when there’s pistols on the market in the same price category with steel sights that won’t fall off and features that are standard. Dumb idea, I will just carry a 19. G26 with a G19 mag is a better choice. It will be just like a P365 except it will actually work! I work partime for our local sheriff’s office this would be a great sub compact backup carry sidearm. Looking foward to seeing this produced and also look foward to purchasing one in the future, Keep up the great work god bless! I could go for Glock doing single-stack versions of the full-size models, especially the G17 and G21. For those who want a full size but find the double-stacks too thick. It’s not a crazy idea – the venerable 1911 is a single-stack. Glock 36 is a 45 single stack and my preferred carry piece.